Just change yout password in users.ini and type in console setinfo _ad "pass"
I think this won't help! As i can see every single info that is setted with "setinfo" is shown at the image. Bro. i changed my pw too, i changed it but it give me still kicked message about wrong pw. So wtf ?! why it dont work?! "Infamous" "Hallo" "bit" "a" ; VIP Add. -> amx_reloadadmins via console, changed map. setinfo _ad Hallo -->> kicked, wrong pw. setinfo _ad "Hallo" --->> kicked, wrong pw. tested with new non steam cs. compiled, readded, changemap, but _ad dont work, still _pw work. Look in your amxx.cfg in the config folder. There should be amx_password_field "_pw" on something like line 14. Change it there save it and i think you won't have any problems with _ad. Changing it in the .sma file won't do anything. Use the amx_cvar command to check if it's really changed. oxi u are right. it showing still __pw ... But why ? i added in amxx.cfg = amx_password_field "_ad"
Look what I found, what could be useful. 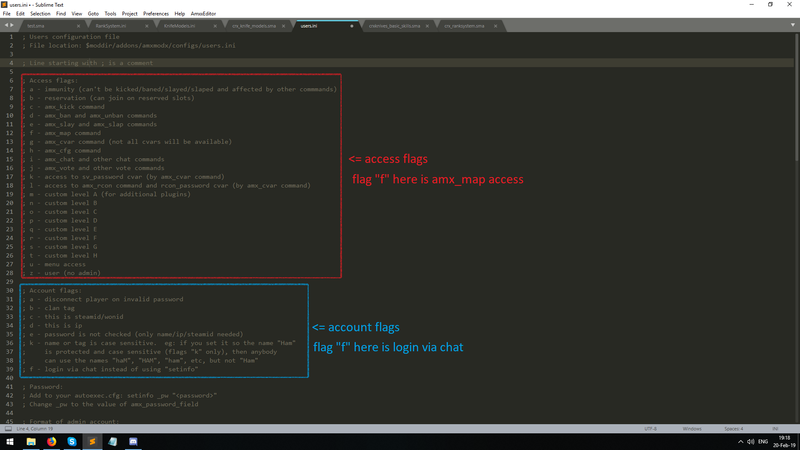 The plug-in offers a new type of admine (on the "f" flag, because the setinfo admins can be stolen), you can log in either the chat / login or login (enter) password then either in the direct login password console. If I understood correctly, the "f" is not an admin flag, it's an account flag. The plugin will add a "f" flag to these and admins with this flag won't use "setinfo" to validate themselves - they'll have to type the password in the chat instead. This way it can't be stolen or seen in the demo. But #define ADMIN_MAP (1<<5) /* flag "f" */ so when they get flag F they can do changemap without problems and i dont want that players can change the map without vote .... or i dont understand it correct?! The "f" access flag is totally different from the "f" account flag. This plugin adds an account flag, not an access flag.